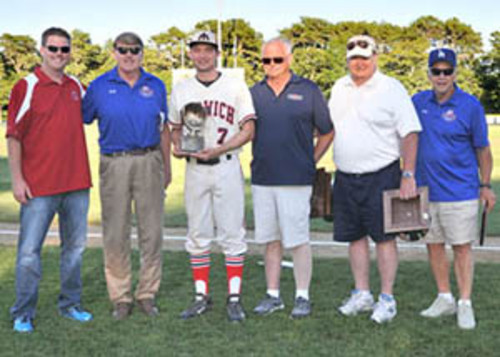 HARWICH Mass.— Austin Filiere (MIT), of the Harwich Mariners, was honored on Wednesday night as the recipient of the 2016 Manny Robello 10th Player Award. The award recognizes one player for showing endless dedication both on and off the field, and Filiere has demonstrated just that. His appreciation for his teammates and ability to set an example on and off the field certainly make him a true 10th player. Filiere has proven to be a leader throughout the season. He has seen 35 games in which he had 29 hits in 117 at bats. He not only leads the team with 7 home runs, but also with 27 RBIs. He was a key contributor to the Mariners East Division Championship title, and he hopes his team continues to find success as they enter the playoffs. “Obviously we want to win the whole thing, and I think our team can do it so it’s going to be very exciting,” said Filiere before going into the first series. This is the second consecutive year the award has gone to a Harwich player. Last year’s recipient was his current teammate Johnny Adams (Boston College). Adams was also the winner of the 2016 Daniel J. Silva Sportsmanship Award. 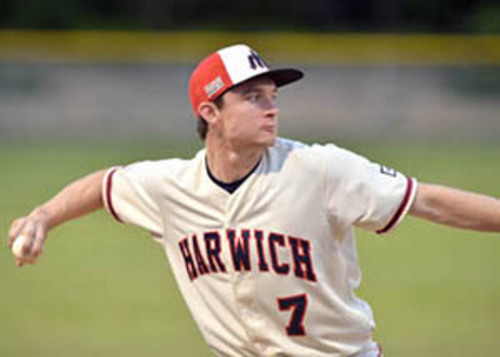 This is the fourth time in the last nine years a Harwich player has won the award. The 10th Player Award was named in honor of Manny Robello. Robello was a cherished and longtime volunteer for the Cotuit Kettleers and the Cape Cod Baseball League. He began as a player on the first Kettleers roster, and over 40 years of service and involvement in both organizations, he became a director of the CCBL. His name continues to honor young players who exhibit hard work, commitment and leadership.